This severe windstorm took place on June 27, 1892 and tore a path of destruction from Jersey Shore to Williamsport to Eagles Mere, causing thousands of dollars worth of property damage. Fortunately no lives were lost. Numerous trees were damaged or ripped from their roots, chimneys were blown down, roofs ripped off and various dwelling received lesser wind damage. The barn of John Ferguson near Jersey Shore was leveled, and Ferguson’s young boy was seriously injured. He was attempting to open the barn door for his father to shelter their horse and buggy when the barn collapsed on him. The boy remained unconscious for more than nine hours but eventually recovered. On farms throughout the path of the storm crops were heavily damaged or wiped out by the storm. In Williamsport, the storm leveled portions of the Mankey Decorative Works and destroyed every chimney from Center to Hepburn Street. The storm also knocked down the smokestack at the Coleman Planing Mill, near Railway Street. Windows on various houses and structures were blown out. 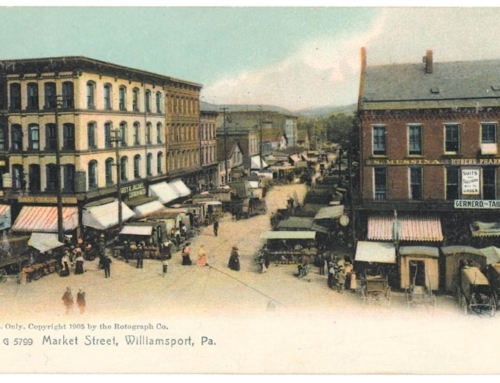 The Williamsport Woolen Factory also was badly damaged. According to the “Gazette and Bulletin, the wind seemed to pick up the large smokestack and drop it in a heap in the wash room just east of the fire. A large shed in the rear of the factory was destroyed. The building in Williamsport that suffered the greatest damage was the Williamsport Turn Verein Vorwarts Hall on Bennett Street. When the wind hit it the building virtually collapsed. Almost everything on the dance floor was smashed. Various items at the club where in a tumbled mess, including tables, chairs, benches, door and window frames. The Williamsport Cemetery on Washington Boulevard was in the path of the storm and received extensive damage, as many tombstones were turned over by the force of the winds. Heavy rains that accompanied the windstorm caused Grafius Run to rise to a raging torrent. It became bank full and many cellars were flooded. Mother Nature from time to time reminds mere mortals who is really in charge and the “Great Cyclone of 1892” was one of the best examples of this.